How to Save/Export iPhone/iPad Text Messages to Computer. Windows/Mac compatible. Decipher TextMessage. Save your iPhone text messages to your computer. Print text messages. Recover deleted text messages! iOS 12.1.4 and 12.2 beta Compatible. Decipher TextMessage runs on your computer and NOT directly on your iPhone, iPad, or iPod. 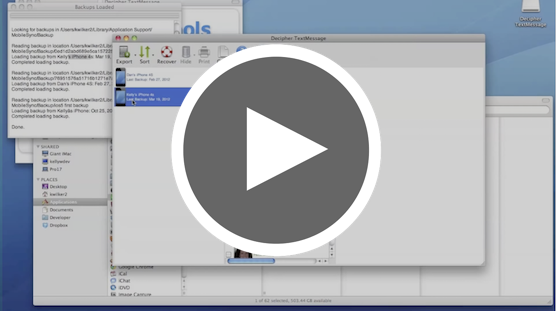 Tap the free trial button above to send yourself a download link for Mac and Windows. OMG, this is awesome and so easy to use! I have every SMS text message saved in a PDF file now with who, their phone number, the date, the time and the message in order and as it displays if I'm looking at it on the phone. Decipher TextMessage is TOTALLY worth it! Step 1: Purchase Decipher TextMessage, or download the free trial to your computer. Step 3: Run Decipher TextMessage. Your texts are now saved to your computer! Help! How do I get the Decipher TextMessage App? You install Decipher TextMessage directly onto your computer. Click here to remind yourself to install the software later! I just purchased Decipher TextMessage. How do I install it? As part of your purchase, you were emailed a link to download Decipher TextMessage. 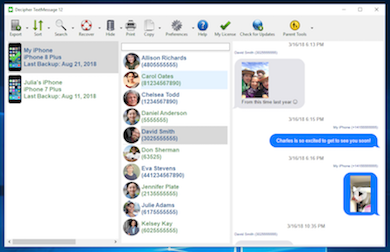 Open that email on your Mac or PC and install the software onto your desktop or laptop computer. You can also download the program onto your computer from our website at any time. 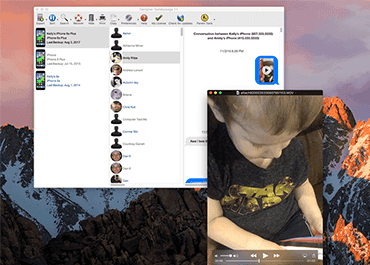 Quickly read text messages from your iTunes backup of your iPhone, iPad, or iPod Touch. 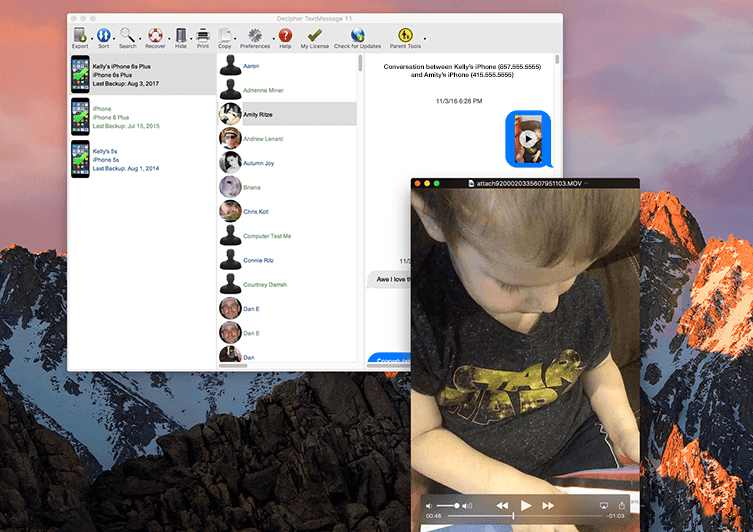 Works with iMessage, SMS, and MMS messages. 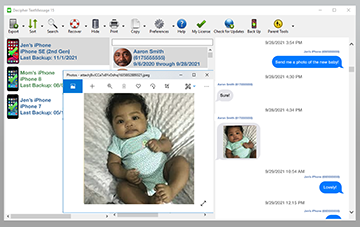 Save and view attachments, such as images and videos. Print iPhone text messages for documentation. Export iPhone text messages to PDF, with formatting similar to on the iPhone. 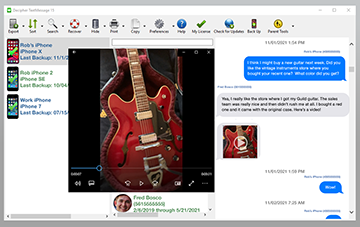 Save your iPhone text messages with photos, videos and attachments. Or, save the messages as plain-text and CSV. Recovers deleted text messages. Read our guide about recovering iPhone text messages and try our free trial to see if your messages are recoverable. Search your message history for important information. Easily see conversations by names in your iPhone Address Book. Supported for Windows 7, Windows 8, and Windows 10. 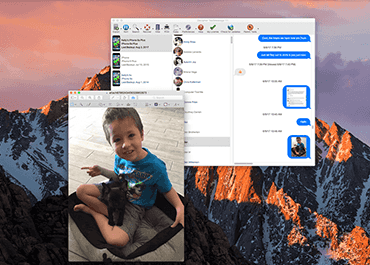 Supported for OS X Lion, Mountain Lion, Mavericks, Yosemite, and El Capitan as well as macOS Sierra, High Sierra, and Mojave. Compatible with all of the latest iPhone encrypted backup formats. Need support for WhatsApp Messenger? Check out our other program Decipher Chat! Click here to see the Decipher TextMessage FAQ page. 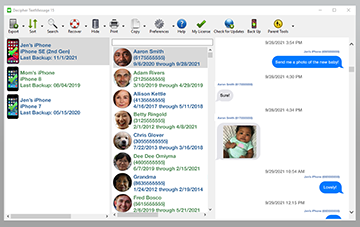 Click here to see the latest Decipher TextMessage release notes. 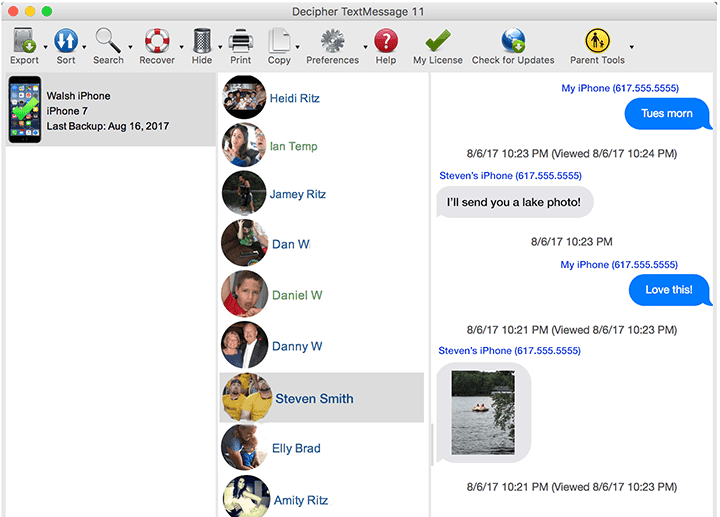 Decipher TextMessage is software for saving your iPhone text messages to your Windows or Mac computer. Decipher TextMessage reads your text messages from your iPhone, iPad, or iPod Touch backup, copying each text message and attachment for safe keeping, and then shows you the messages in an easy-to-read layout organized by contact. Within Decipher Textmessage, you can simply read your messages, or export them for printing or use elsewhere. Text messages are backed up by Decipher TextMessage, creating an ongoing archive of your texts for future use. 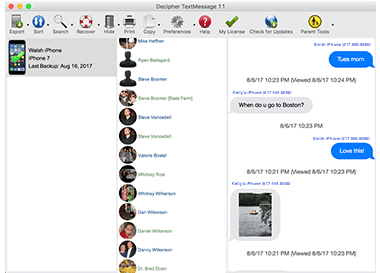 Decipher TextMessage runs locally on your computer so your message data stays private. Here at Decipher Media, we understand the importance of your data. We love Decipher TextMessage not only as product, but also for the many opportunities it has provided us to help people restore or access important messages. If you have any problems with Decipher TextMessage, or just have questions about your iPhone text messages, please feel free to contact us. Before contacting us via the support email, we ask that you read our FAQ since many helpful answers are available here.